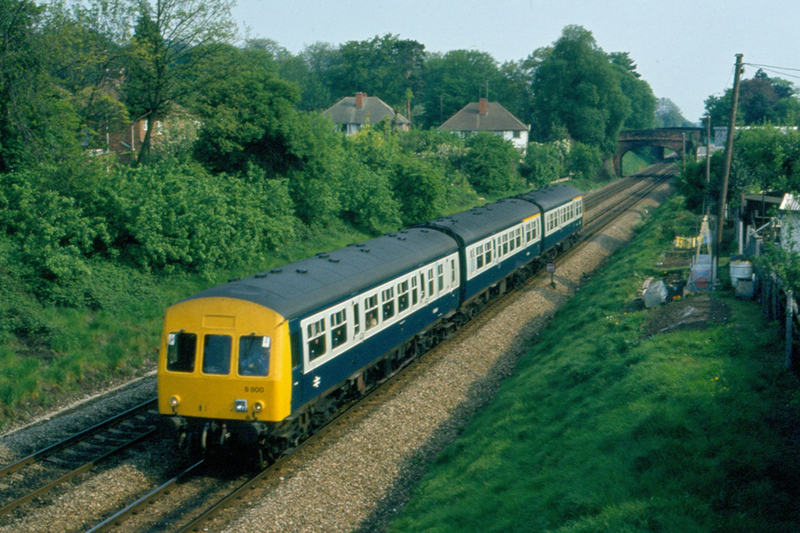 The class 101 diesel multiple units ran with two, three or four cars in each set. Starting in 1958 the London Midland Region's Monument Lane Diesel Depot in Birmingham received an allocation of two and three-car sets which could be seen operating passenger services in Worcestershire. Some units which started work on other regions of British Railways were later cascaded to Western Region depots and these also operated in the county. In regular formation the three-car sets at Monument Lane consisted of a Driving Motor Brake Second (DBMS) with 52 second class seats, a Trailer Composite Lavatory (TCL) with 12 first and fifty-four second class seats and toilets, and a Driving Motor Composite Lavatory (DMCL) with 12 first class and fifty-three second class seats and toilets. The two-car sets were made up of a DMCL and a Driving Trailer Composite Lavatory (DTCL) with 12 first class and fifty-three second class seats and toilets. 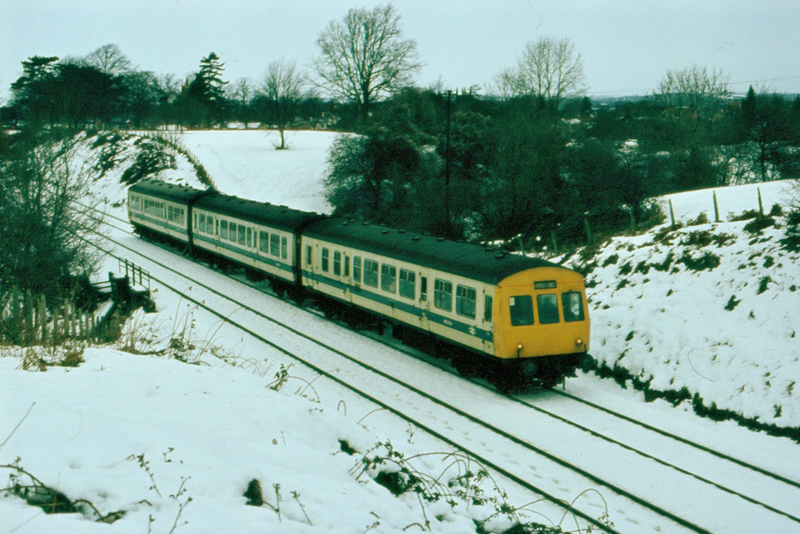 On a snowy 14th December 1982 Robert Cooke photographed this Tyseley based class 101 three-car diesel multiple unit in white livery with blue stripe that was applied to units as they were refurbished in the 1970s and 1980s. This set consists of Nos.50309, 59121 and 50338 which were allocated new to Monument Lane Depot in 1958. Photograph taken at Malvern Common. On 13th April 1982 Bristol based three-car class 101 diesel multiple unit set No.B800 consisting of cars Nos.51445, 59545 and 51515 was photographed by Robert Cooke at Perry Wood on the outskirts of Worcester. Notice that both the centre and trailing cars have first class seating areas. 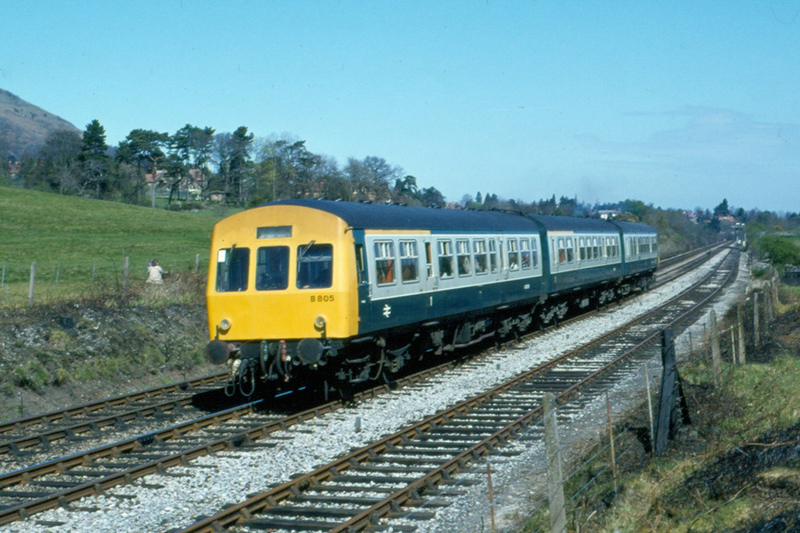 Bristol based class three-car diesel multiple unit set No.B805, with cars No.50304, 59122 and 50329, at Malvern Wells. The nearside track is the Malvern Wells 'down' loop used for the stabling stock of trains that terminate/start at Great Malvern. Photograph taken by Robert Cooke on 18th April 1980. 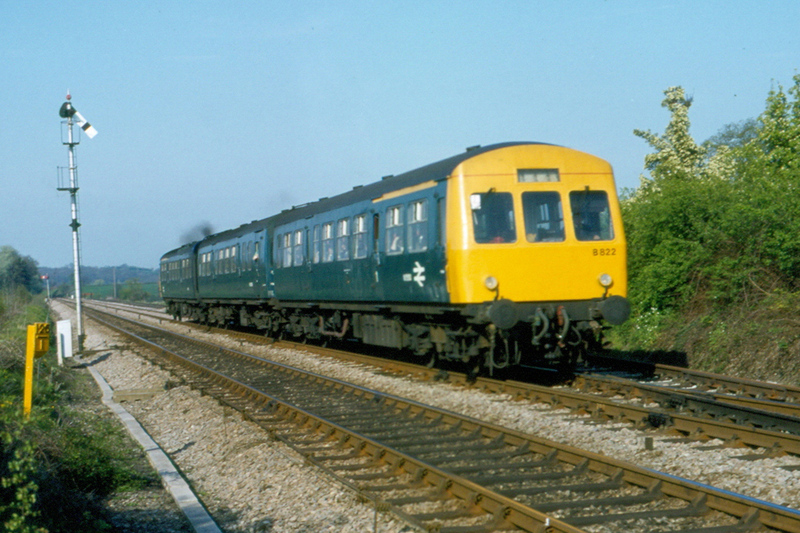 In all blue livery Bristol based three-car class 101 diesel multiple unit set No.B822 had charge of the 17:03 local train from Worcester Shrub Hill to Great Malvern. This set consisted of Nos.51495, 59096 and 51510. This set was made up of two Driving Motor Composite Lavatory (DMCL) with 12 first class and fifty-three second class seats and toilets with a Trailer Brake Second Lavatory (TBSL) in the middle. Photograph taken by Robert Cooke on 27th April 1982.